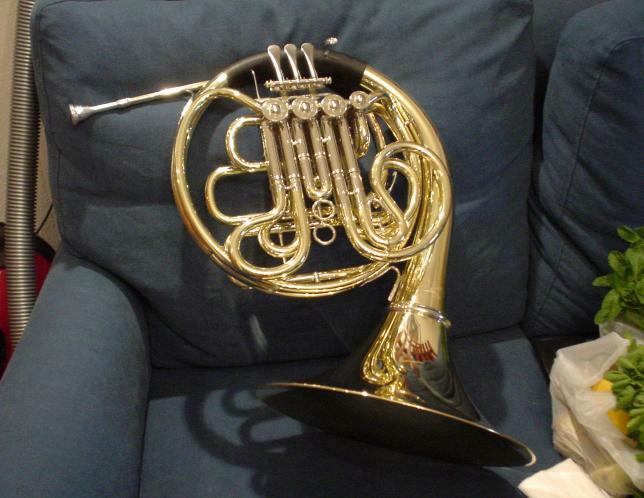 I am the proud owner of a Ricco Kühn double horn, model W293. (the bag is a Bags case) It is truly a wonderful instrument, which I selected after thoroughly evaluating Alexander (models 103, 403, 1103, 200), Cornford (C23 and C28), Willson (CS 240) and briefly looking at another Kuhn (W263) and Engelbert Schmid (F/Bb double and F/Bb/Eb triple). My battered East German Tank (Hans Hoyer 801, Vintage 1989) double horn is enjoying its well-deserved retirement. I first tried my Tilz D4 as a test object, with using a pair of padded pliers and a rubber hammer. After scratching that one badly (the padding wasn't padded enough), I had a more sensible idea and drilled an 8 mm hole in a piece of wood (multiplex to be precise). I put in the mouthpiece as far as it went, took the piece of wood between my legs and used my hands to pull the cup of the mouthpiece backwards (it took quite a lot of force). With this method, the bend now starts 1 cm from the end of the stem, and the mouthpiece sticks out a little more (.5 cm) from the leadpipe than it used to, but it still fits OK. I found my optimal angle by simply trying, and finally settled for +- 8 degrees. After a few minutes of deliberation, I also subjected my current piece to the same treatment. Addendum, April 2004: my new Ricco Kuehn horn is actually easiest to hold with a straight mouthpiece, so I have bought a new Schmid 105 mouthpiece. (which is nicer and shinier to boot). With this piece the instrument speaks slightly easier in the high range than with a bent mouthpiece. 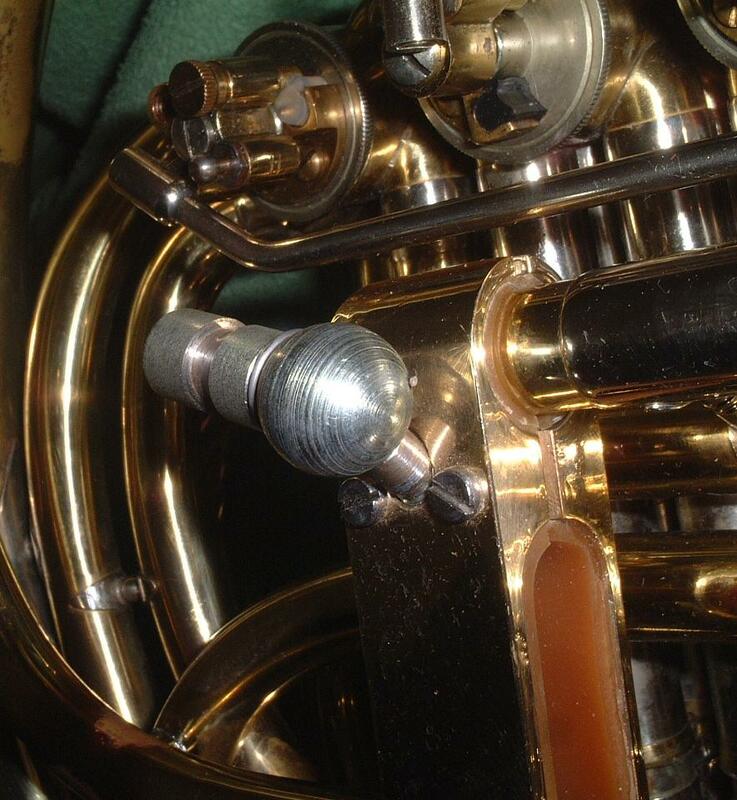 This might be caused by the bad fit of the bent mouthpiece stem in the leadpipe. 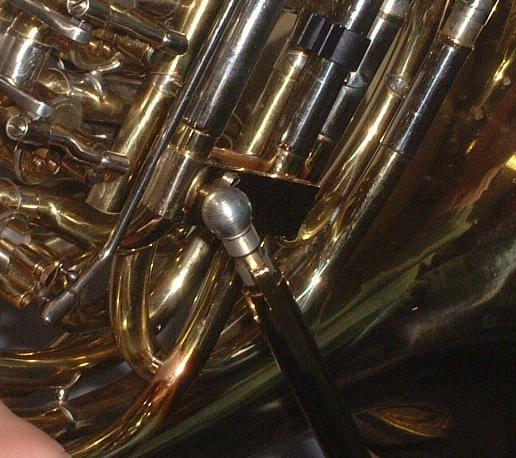 The hornstick, the ergonomic tool for playing French Horn. The hornstick is a beautifully made stand for French Horn. The hornstick supports the horn on the thigh whilst you play, lessening the strain on your shoulders and back. The stick attaches to a ball-joint, which is attached to the tubing of the horn. The attachment is simply screwed on, and a variety of shapes is available to fit different makes of horns. A simple click-on mechanism allows the stick to be attached and taken off easily. The stick can be adjusted in height using a screwing mechanism. There are now also different models of horn supports on the market. The Horn stick somewhat resembles the PipStick, but is somewhat cheaper. My model is manufactured by Richard Speetjens and Hans Grobbenhaar, reachable by by e-mail at hornstick (at) hetnet.nl. Nowadays they also have a cheaper model manufactured from aluminum and plastic. See also the advertisement (Dutch) at the Dutch Horn Society. 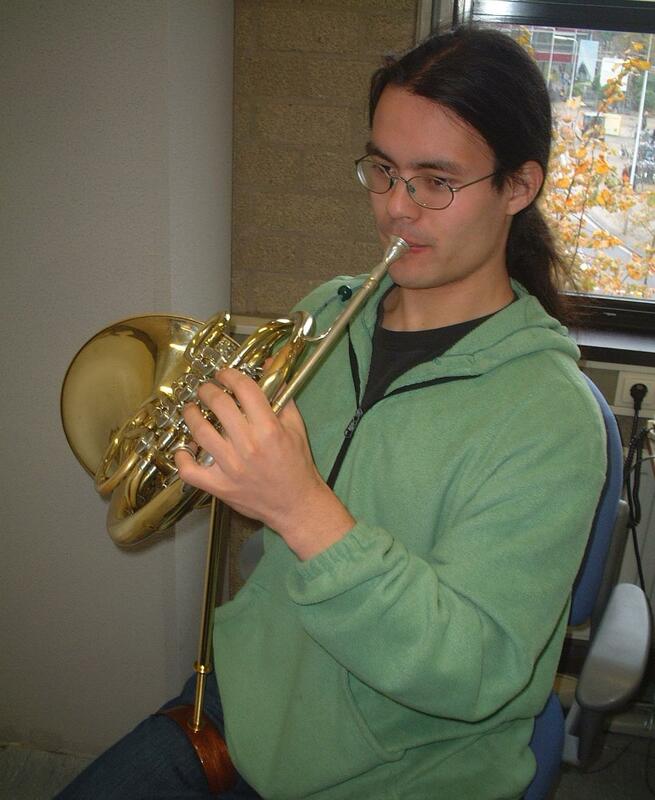 The Dutch horn society has a webpage showing different brands (in Dutch). 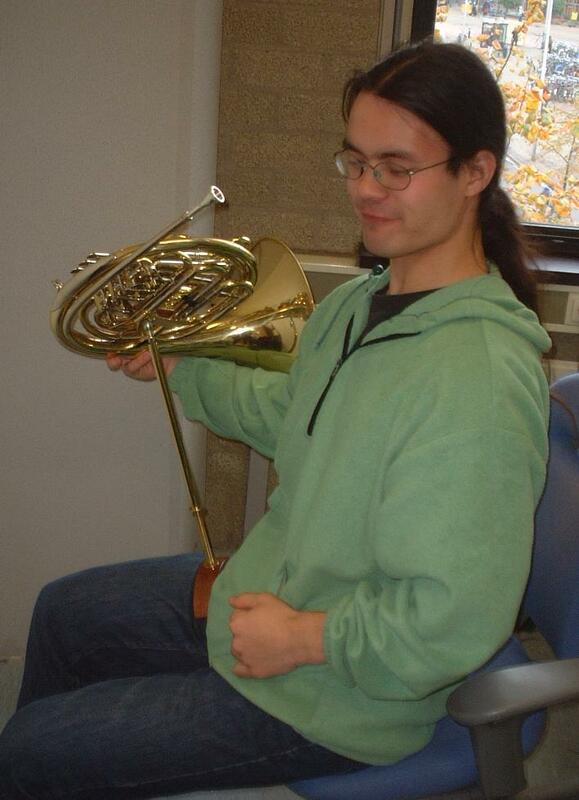 Addendum, April 2004: my new horn teacher has completely revamped my playing technique, putting the focus on relaxing the entire body while playing. This improves the tone tremendously, and it also makes holding the instrument a much lighter task. I now only use my hornstick for long rehearsal sessions. Go back to personal stuff, or back to my entry-page.